One major oversight I committed last year was not finding a place for the Corey Dennison Band’s eponymous debut release on my year-end Top 20 list. Although I’m not sure what I would have replaced on my final list, I really should have found a place for it. The Chattanooga-born, Chicago-based guitar/vocal powerhouse certainly hit all the right notes on one of the best debut releases I’ve heard in a long time. Blues fans and writers felt the same way and included the album on their end-of-year lists as well. The band and album also earned several nominations and awards as well. Dennison’s sophomore release for Delmark, Night After Night, mines much of the same territory as its predecessor, but it would be foolish to call it “more of the same thing.” Dennison’s rich soul-drenched vocal style and sturdy guitar work and his savvy backing band (Nick Moss alum Gerry Hundt – guitar, organ, harmonica, Nik Skilnik – bass, Joel Baer – drums, percussion) rip through a superlative set of eight original tunes and five choice covers that cover the musical gamut from blues and soul to gospel and southern-flavored rock. The opener, “Hear My Plea,” really sets the mood for the whole album. Dennison’s vocals and guitar are full of passion and regret, and it’s easy to imagine that this disc will peak with Track One, but that’s not the case. In contrast, the next track, “Misti,” is an exuberant love song that would receive regular radio play if this was a just world. Speaking of exuberance, check out “I Get The Shivers,” a rowdy rocking shuffle that probably gets heads bobbing and booties bumping when played live. The reflective “Better Man” is a soulful autobiographical track with Dennison acknowledging those who preceded him and their influence on his life. The band’s versatility is on display with the funky soul of “Phone Keeps Ringing” and “Nothing’s Too Good (For My Baby),” which marries Memphis with Motown. Dennison backed Carl Weathersby for a dozen years before striking out on his own, and he pays tribute to his musical mentor with a magnificent take on one of Weathersby’s best songs, “Love Ain’t Fair.” Tyrone Davis’ “Are You Serious” will remind listeners of those great soul/R&B tunes that permeated the air waves in the late ’70s and Dennison’s vocals are more than up to the task for this fine cover. The talking blues “Nightcreeper 2 (Still Creepin’)” is a funky sequel to a track (“Nightcreeper”) on Kilborn Alley’s The Tolono Tapes album, which included Dennison and Hundt as guests. The slow burner “It’s So Easy” features both Dennison and Hundt on guitar and is the last original tune on the disc. The band closes with three fine, far-ranging covers: the Cate Brothers’ “Stuck In Chicago,” the stirring gospel standard “Going Home To Live With God,” and a raucous “Down In Virginia,” that leans more toward Magic Slim than Jimmy Reed. 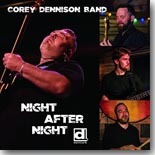 The Corey Dennison Band provides blues and soul fans a perfect mix of Chicago blues and Memphis soul. In this day and time, there’s nobody that does this sound better than these guys. Night After Night is an essential purchase for fans of either of these styles.